Anyway, seems to work, but if anyone is aware of an existing function for this, please pass it along. getDescendants(...) and Descendants(...,type="all") are exactly the same. They also have virtually identical run times (which is interesting as the two functions are coded very differently. Would have used this if I'd known it was available! I recently discovered a problem which was that different programs (and R functions) will number the internal nodes in different ways, which is a problem if you are trying to, say, run an analysis over 1000 Bayesian trees of possibly different topologies and extract statistics etc. for common clades in these analyses. Basically, there is postorder node numbering, there is the way an R phylo object does it, and there is index number counting from 1 of the way an R phylo object does it. I wrote a function to sort it out. Nick. Thanks for posting. I haven't had a chance to look at this yet, but you are definitely correct that (even for the same topology & branch lengths) there is no requirement that corresponding nodes align. Actually I should say that you need a different function for comparing different trees and identifying corresponding clades. 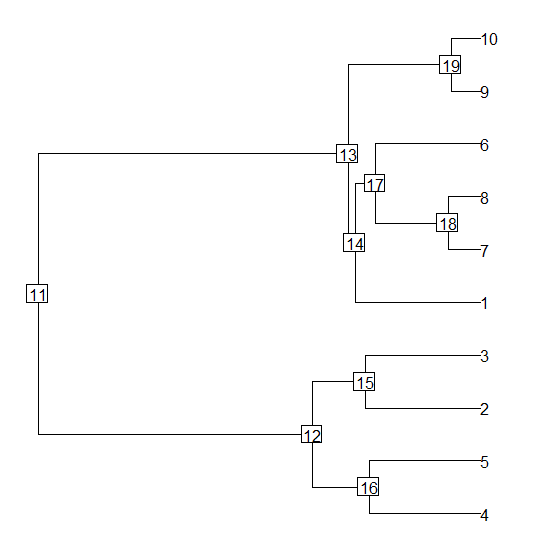 The above just shows the node labels on a given tree under three different labeling schemes. It should just cut-paste to R. Cheers! Uh-huh, good point. That's why topological similarity is best defined by edges, i.e., splits (e.g., R-F distance). There is still the practical issue that (by the ape standard for a phylo object) there is no particular required numbering scheme by which topologically and rotationally identical trees have the same node numbers. the function get.desc.of.node() (internal function in the auteur package) is not doing the same thing as well? why it works when you introduce the tree directly into a variable? No, you're right. Evidently, there are two functions in auteur: get.desc.of.node and get.descendants.of.node. The former retrieves only the immediate descendants of a given node. I don't know how you discovered this as it is not described in the auteur documentation! 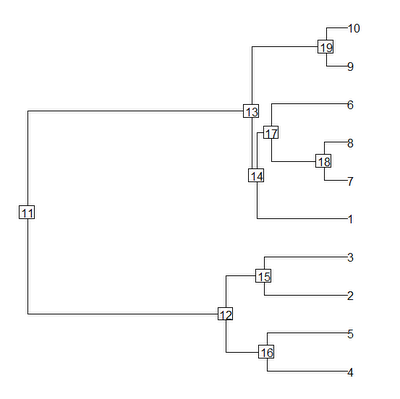 Evidently getDescendants(tree,node), Descendants(tree,node,type="all"), and get.descendants.of.node(node,tree) are all functionally identical, although they are each coded quite differently! Good discovery. oh! i can see I had misspelled it in my first post! it is used in one of the examples of the manual. I am trying to get the descendant edges for each edge of a phylogeny. Have you managed to do that too? Here I was able to get the number of descendant tips for each edge (please, see if you agree with my solution). However, it would be also useful to know which are the descendant edges for each edge. Do you have any idea? Ops, it seems your function already answers my question. Also, my code seems to be wrong, as it gets the number of tips for the node before each edge. Hi - shouldn't the getDescendants() function have which(daughters>length(tree$tip)), not which(daughters>=length(tree$tip)) (i.e. use strictly greater than, not ">="? Yup. That's a bug. Thanks for catching that. I will fix it.